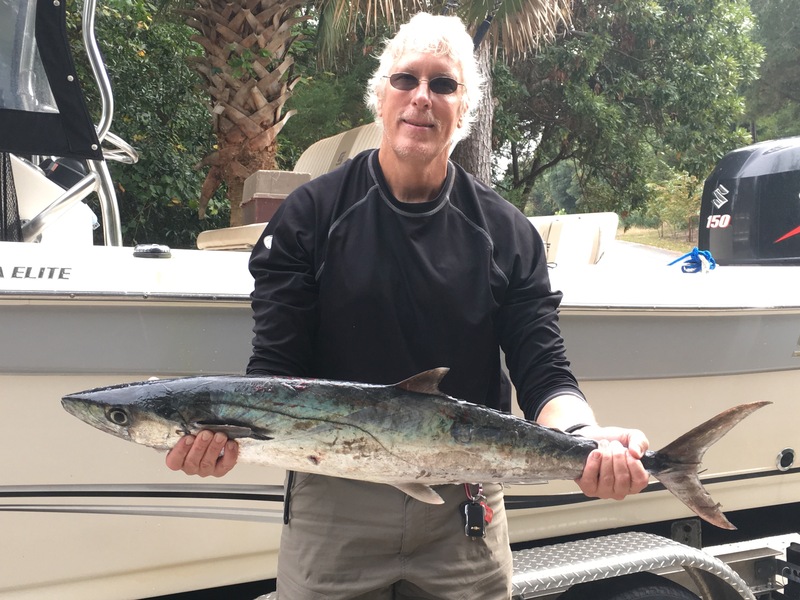 In the fall, before the water temperature drops below the upper 60’s, the king mackerel show up in numbers in the near-shore waters off the southern banks of NC. I’d not been able to fish as much as I wanted this fall, due to conflicting cycles of travel and weather. When the weather was good, I was working or traveling, and when I had time the weather was less salubrious. I did manage to boat a few kings this season, notably managing to squeeze in a <4 hour trip between conference calls today (11/6). It was a dead calm day, with fog all day, which is highly unusual. Slick seas, but 1/2 mile visibility. Landed two, an 8 pounder (26″ FL) and a 17 pounder (37″ FL). The bigger fish gave me several great runs as I brought him in. Now, as we’re looking at a cold snap, rain and wind for the next week, I can be happy I caught some! This entry was posted in Fishing on November 6, 2017 by joel. One of the great things the local TU chapter does is to work with the local YMCA to run a winter trout fishery. 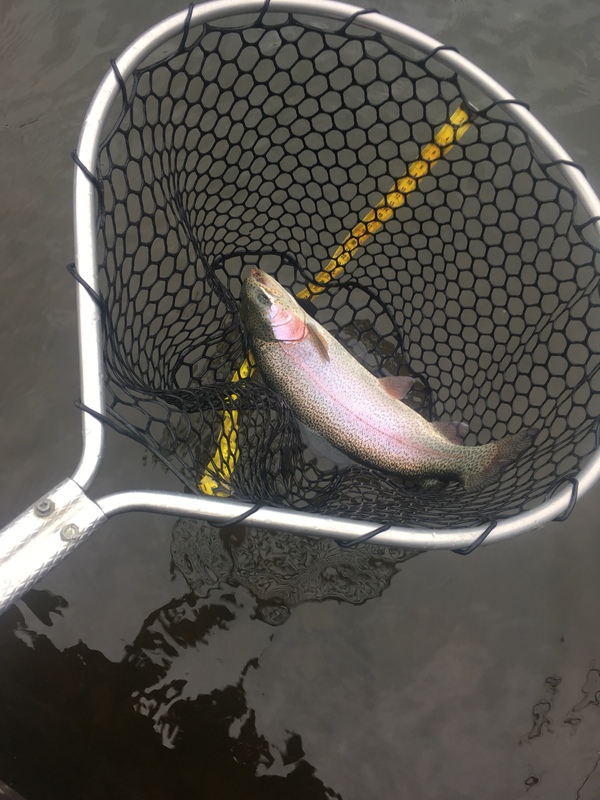 They put 2000 trout in the ~5 acre lake in October, and again later in the season. 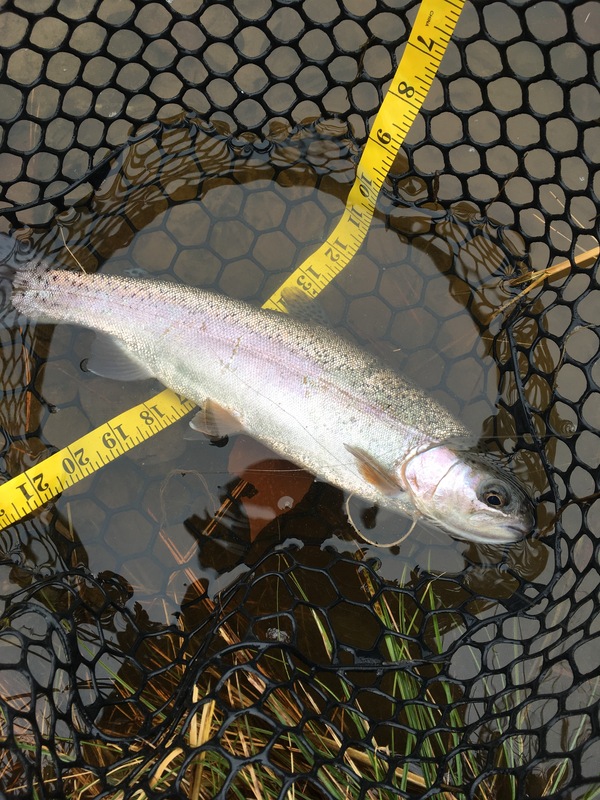 This gives us piedmont residents the chance to catch trout 15 minutes from home, rather than 2 hours! 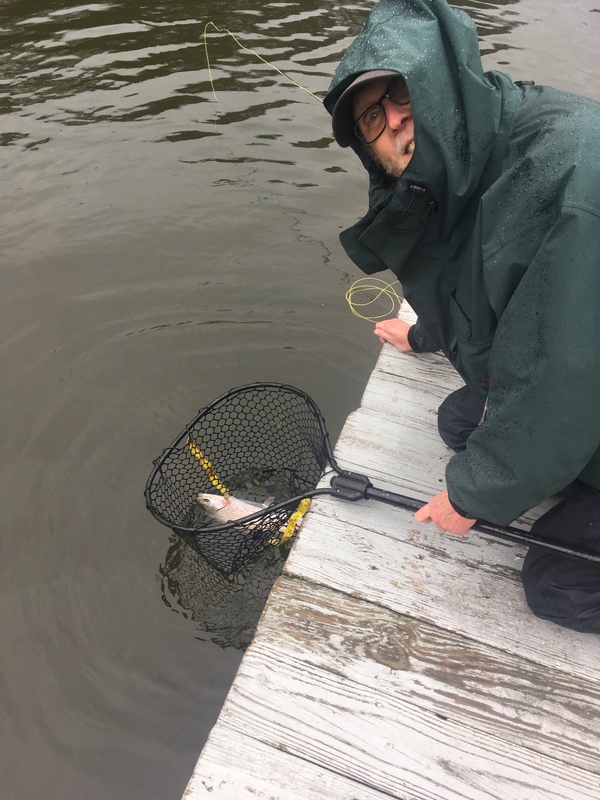 Today was gray, overcast with temperatures in the low 40’s and spitting rain, but it was one of the two dates Sam and I had booked this season so off we went. 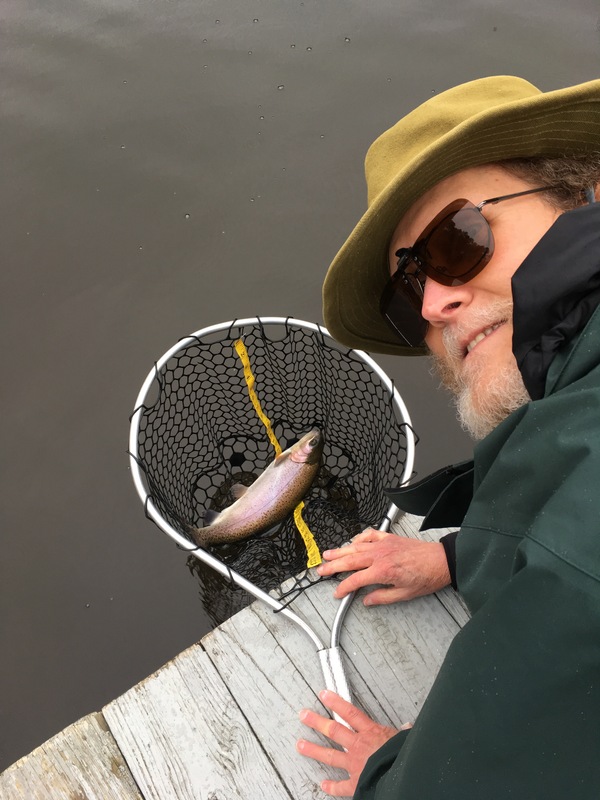 I started quickly, catching a nice rainbow less than 10 minutes after getting to the lake. I’d have to wait awhile for others, but we caught fish throughout the day…not fast action, but each of the 7 anglers caught several. Sam and I each netted 8 or so nice fish, with other break offs and missed strikes. A great day! We used nymphs, dries and streamers. It varied throughout the day. No discernible hatches, so catches were a matter of getting the fly in front of a cruising fish. You might think this is like shooting fish in the proverbial barrel, but not so! These can be very tough fish to catch, especially when they zero in on hatching midges, for example. 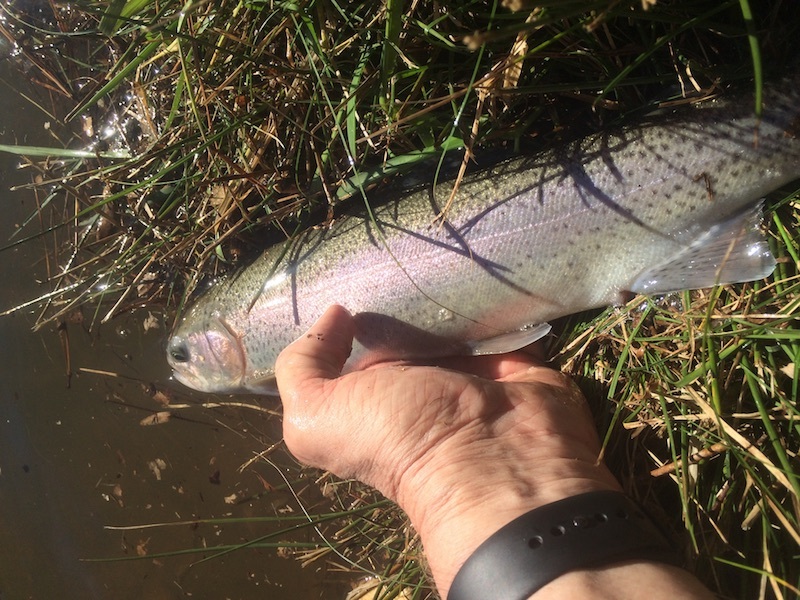 This entry was posted in Fishing, Flyfishing on December 4, 2016 by joel. As my (one or two?) regular readers know, I like to visit a local “lake” that the TU chapter stocks with trout for a winter fishery. Let’s see, trout, hanging out with a few fellow anglers I don’t see often enough, only 15 minutes from my house, what’s not to like? On January 9th, I had one of my two seasonal visits to Clearwater. The fishing was slow, as recent rains had muddied the lake, but all the 8 anglers there each caught a handful of nice fish. I caught mine on egg patterns, a fly that I’ve historically used in the winter with great success, but not at Clearwater. Great fellowship, and always fun to hang with my fishing buddy, Sam. Already looking forward to the next trip there! TU said that they put a lot of browns in the lake this year, but I didn’t see any. Maybe next time. 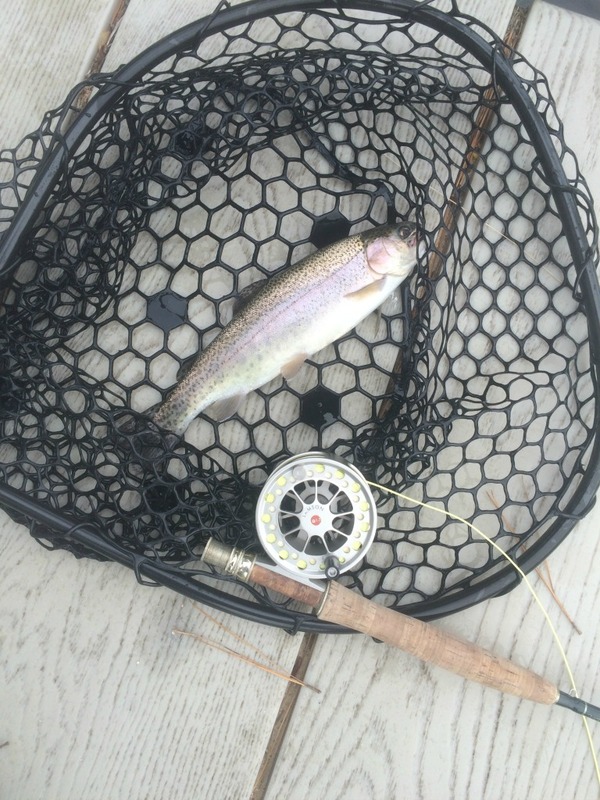 This entry was posted in Fishing, Flyfishing on January 17, 2016 by joel. 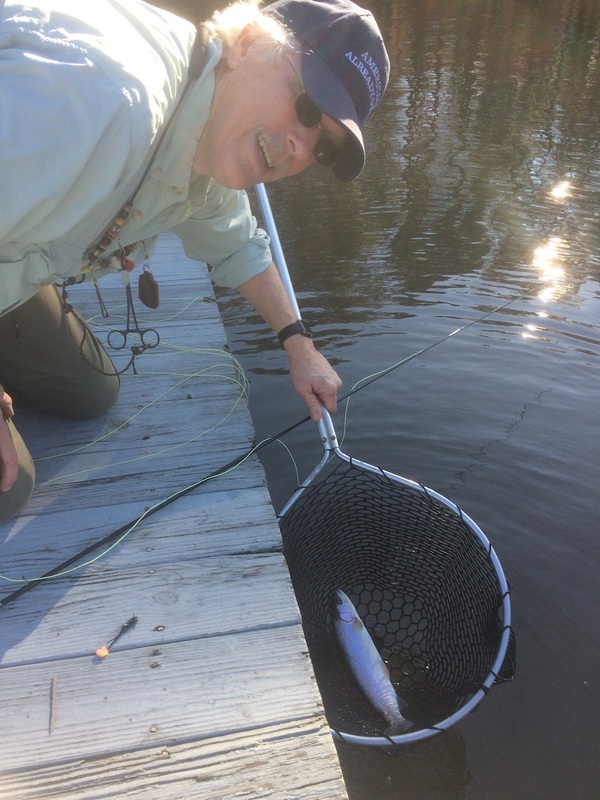 I’d been eagerly awaiting the “trout season” at Camp Clearwater lake, just a handful of miles from my house in Chapel Hill, NC. 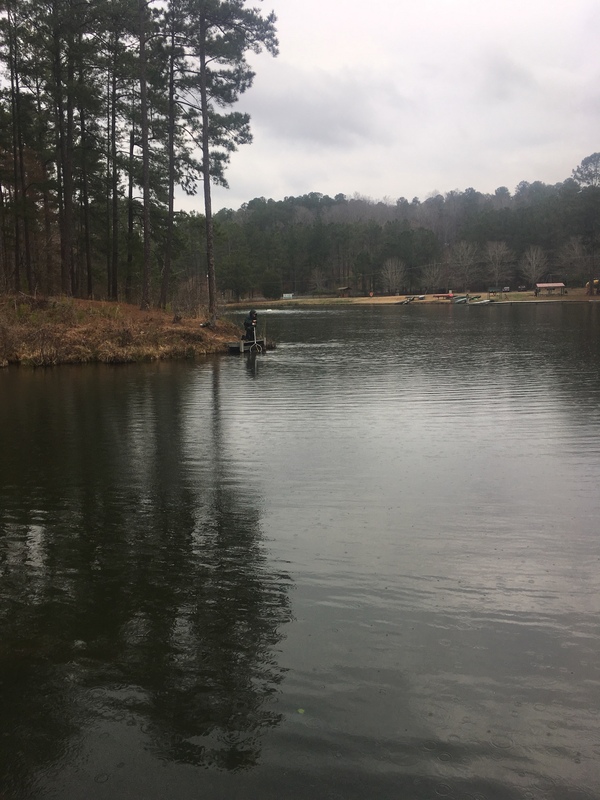 The lake is seasonally stocked with rainbow trout by the local Trout Unlimited chapter and it’s run as an annual cold-weather catch & release fishery. 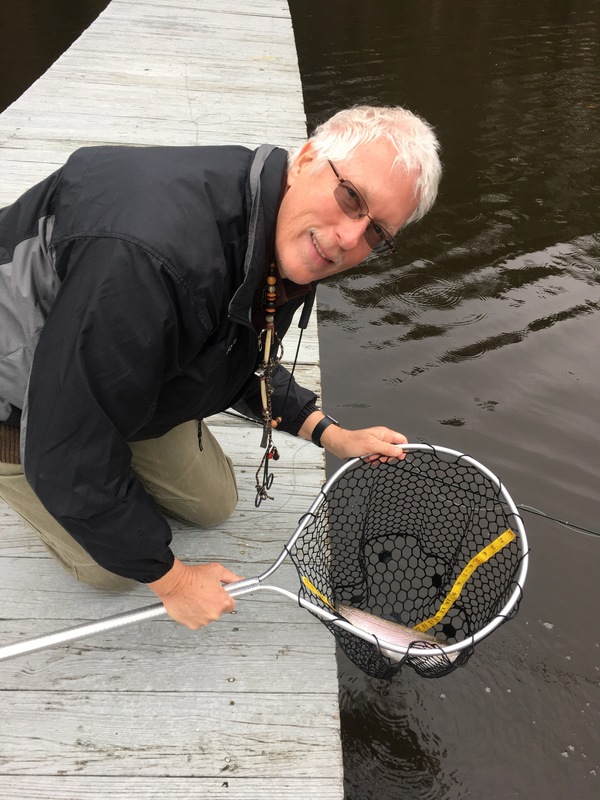 The trout get acclimated very quickly, getting tuned in on the mayfly and midge hatches, and can be quite challenging to catch. I arrived just after the gates opened at 9am, having booked one of the eight angler slots. While I was rigging up, my buddy Sam pulled up, and we strategized on fly selections for a chilly, overcast day. The morning was above freezing, unlike the previous day, thankfully. I started with a Chili Pepper, having used it to great success at Clearwater in February. I caught a nice trout on my second cast! I had a couple more strikes, but then things went cold for me. Some of the guys on the other side of the lake seemed to be doing better, and we figured we’d swap intel at lunch. I picked up this very nice fish in the late morning, also on the Chili Pepper, but overall it was a slow morning. We saw that some folks were having success with nymphs suspended below a strike indicator, a technique we’d used at Clearwater before. I lost a really nice fish to a bad knot and then promptly landed several nice fish, including this one below, using a stimulator for an indicator with a bead-head flashback pheasant tail dropper. We were casting well out into the lake, 40-50 feet, and the takes were slow and soft, but the action was steady. Then, Sam picked up 3 or 4 fish on a tiny midge dropper. It was a size 20 bead-head that had a brown body, called a “Sweet Thang,” and it sure was. In the meantime, I’d not had a strike for a while on the pheasant tail, the air was filling with midges, and trout were jumping. I bummed a “Sweet Thang” from Sam, and we each caught several more nice fish on that combo (again, I had the stimulator as an indicator). We ended the day with the pleasant feeling that you have when you’ve caught plenty of fish, and when you LDR one, that’s great, since you didn’t have to net ’em. I headed home about 4:30 and lifted a beer to a great time with good friends and fine fishing. 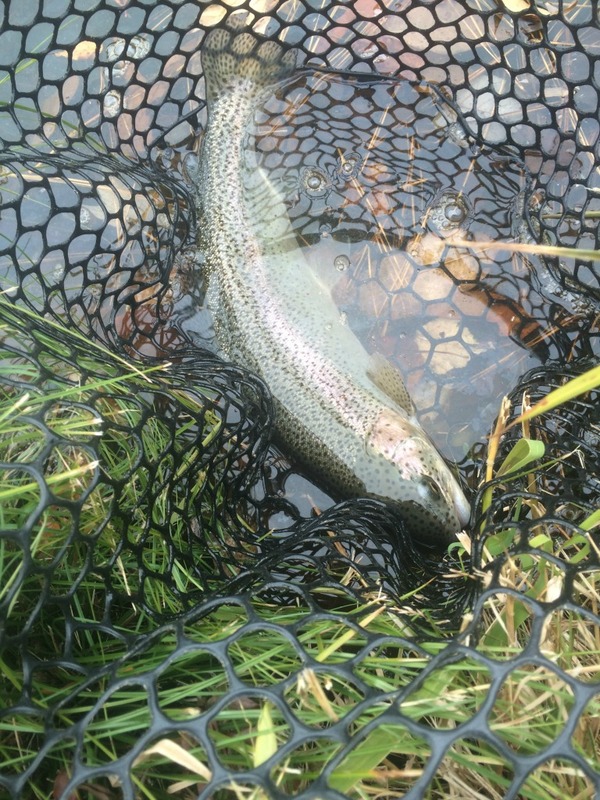 This entry was posted in Fishing, Flyfishing on November 16, 2014 by joel. The calendar said spring, but the weather was anything but springlike this morning when I headed to pick up Sam for our annual trip to Weldon. The temperature had dropped into the mid 20’s overnight, and was still below freezing when got to Sam’s house. 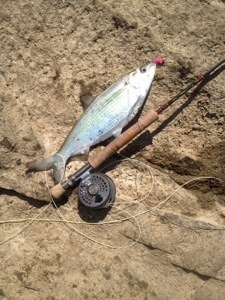 It’s a good thing shad fishing is “civilized” with the bite being largely unaffected by time of day. We figured that by the time I navigated the traffic jam to his house, factoring the 1:45 hr drive to Weldon, we’d be on the Roanoke River by 10:30. And we were, but the temperature was still at freezing when we put the canoe in the river to paddle over to our favorite rock. We portaged the “big rapid” and set up shop at the top of “Little River,” a fork that creates a large island. There was one boat anchored about 50 yards downstream of our rock, and they were catching fish. That’s a good spot they were in, but in a canoe it’s difficult to anchor and fish in such fast water. The flow was at 7400 cfs, higher than I’d like, but fishable (at that level, a river-knowledgeable captain can take a power boat up the rapids, but I would not want to do it at less than 10,000cfs) . The trick with shad is to find the right seam in the current and the right depth, along with the right color fly and right speed of retrieve…small differences can have a big impact on success. Our position was good, but not ideal given all the variables today. The fish were there, but not in the numbers we’ve seen on some trips. The water was still quite cold due to the late spring. We started with pink flies and orange flies, but no strikes. We were using intermediate sink tips on 7wt rods. As much as anything, this is because you spend the day making long double-hauls, and it’s just easier with a rod with some body strength. Finally, since we weren’t catching anything, we hollered to the guys in the boat…”what color?” They said green and yellow. Tried that and started catching some fish. The sun went behind some clouds, the wind kicked up and I was seriously thinking about putting on my neoprene gloves, in late March! Geez, this is the South! After lunch, we tried some other colors, and pink produced as well as chartreuse. Go figure! All told, each of us caught 15-20 Hickory Shad. These are strong, acrobatic fish that will bend your rod. 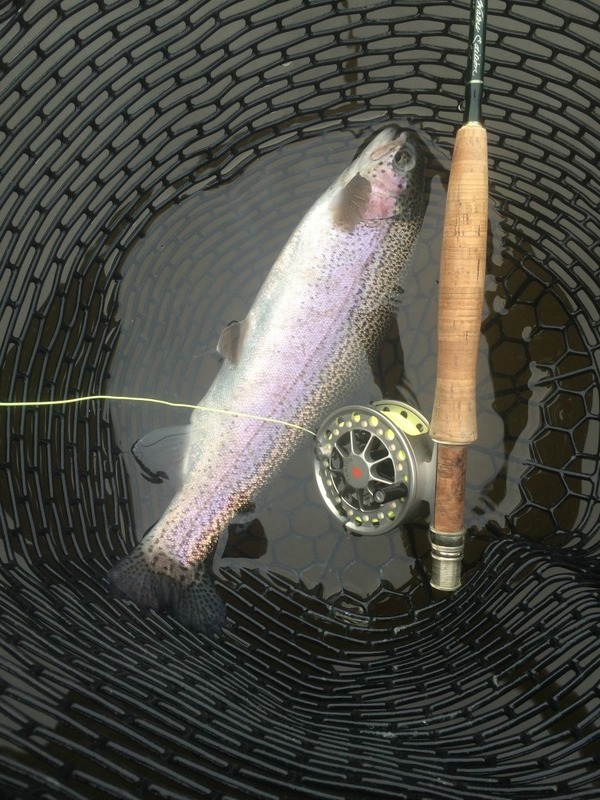 This entry was posted in Fishing, Flyfishing on March 27, 2014 by joel. I returned to the coast Thursday evening, but the weather forecasts had been going downhill all week. The cold front that was to kick out the low pressure area was going to stall and produce rain on Saturday. Hmmmm. I was planning to work remotely on Friday, including 4 hours worth of scheduled search committee phone interviews in the late afternoon, but Friday was going to be the best weather day of the next three days. OK, nothing time-critical that needs to be done on Friday morning, so shift a half-day to Saturday, when I’m sitting in the house watching it rain, anyway. Fish in the morning and do concalls in the afternoon. Sounds like a plan! Jan and I headed out after breakfast Friday (and a quick beach walk for the dogs, who were quite pissed about getting left), launched and motored thru Bogue Inlet, and started searching the sky for birds working fish. Didn’t see any, so we just rolled the trolling lines off the stern and headed east. After 10-20 minutes, I spotted a disturbance on the water, soon followed by a flock of gulls, as we headed in that direction. We picked up a couple of small blues on the Gotcha’s. Then, as if someone had flipped a switch, we started seeing fish and bird activity all around. We caught a couple small Spanish along with more blues. We trolled for probably an hour more until we’d boated a half-dozen mackerel, all I wanted to clean and for eating while fresh. We released a good number of blues. I tried to plug up some fish while they were active, but the pods were quick to the surface and then sounded, and I couldn’t get in range with the plugging rod, much less the flyrod. Besides, the bite had slacked off, anyway. We toasted another successful fishing trip and headed in. Going thru the inlet, the tide was running out fast, and the rollers were big at the bar, several feet up and down the waves as we went thru. The “Defined Benefit” did a great job on that. When I got past that and sped up to plane, I noted that there was at least a 5mph difference between the GPS speed and the “water speed” on the boat speedometer, and the buoys were leaning heavily seaward. Got back, did calls, hosed down the boat, pulled the fish out of the fridge and cleaned them. 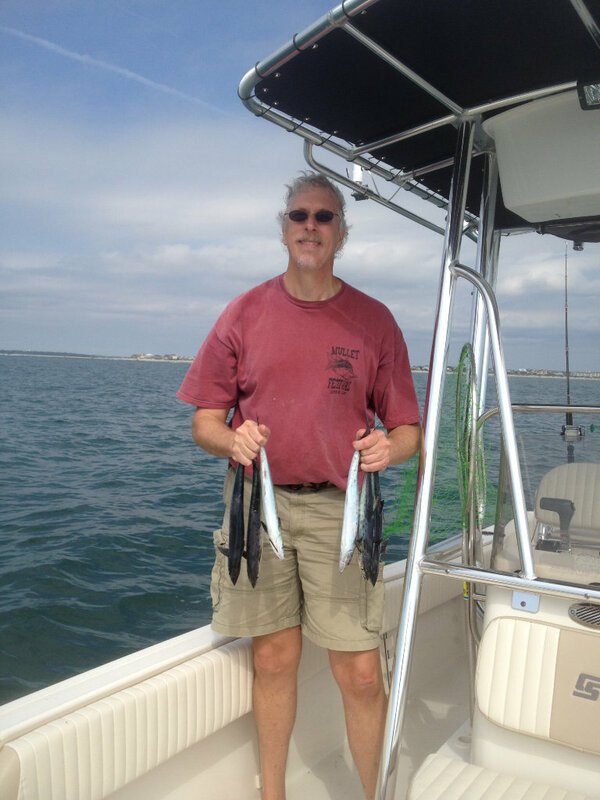 This entry was posted in Boating, Family, Fishing on October 18, 2013 by joel. The weather this past weekend was not the best, but Sunday was nice enough to take the boat out for a few hours of fishing. I’d moved some fishing gear on board, putting on a couple of boat rods for trolling, as well as plugging rod, and a variety of casting and trolling lures. I’ve also put my 9wt flyrod on board as well for times when the fish are on the surface. It was overcast and cool with a 10 to 15 mph north wind as Jan and I headed from the ramp, around Archers Point, under the bridge, and out of the sound thru Bogue Inlet. The beach here faces south, so the north wind flattens out the ocean like a lake for the first couple miles offshore. As we headed out the channel, I spotted a cluster of boats around the first sea buoy. Didn’t see any birds working or signs of obvious fish activity, but I dropped a couple of lines off the stern and headed generally east (parallel to Bogue Banks), about a mile offshore. After a while, I took off the Hopkins and gold spoon I’d been trolling and put on two Gotcha plugs. Then I looked and saw some birds working the water several hundred yards away and we turned and headed in that direction. I got out the plugging rod and moved to the bow while Jan had the helm. Soon, she said, “is this rod supposed to be bouncing like this?” I put down the plugging rod and went to the stern and pulled in a nice Spanish Mackerel. We trolled a bit more, and picked up some small bluefish. A couple times we had more than one on, and Jan had to bring one in. The blues were vigorously working the water all around and I caught several on the plugging rod. I thought about rigging up my flyrod but decided to leave it in the rack. We moved around the area, which oddly only a few boats were on. There was some vigorous disturbance on the water and we moved closer. I’m not sure what was there, but they were big. Saw dorsal and tail fins that made me think it was a pod of sharks. Jan asked if we could put some distance between us and them 😉 . One of the boat rods dipped again, and it was another Spanish, bigger than the first. By now, the sun was out and it was warming up, contrary to the forecasts. We puttered around a bit more, plugging up some more blues, and then decided we’d had a great time and headed for port. A great day! I’ll be back this coming weekend, and hope to repeat! 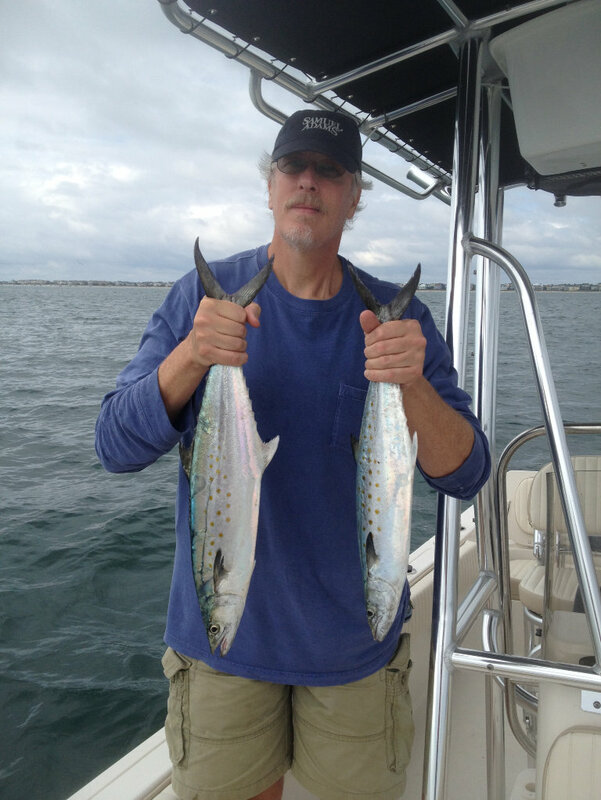 This entry was posted in Boating, Family, Fishing on October 14, 2013 by joel.